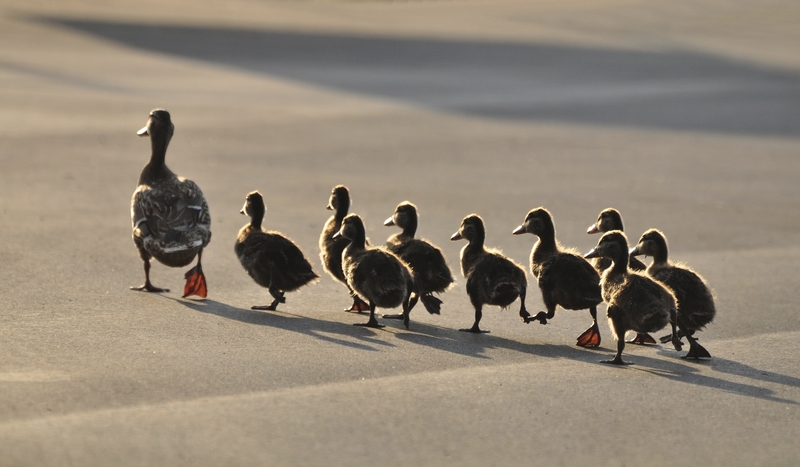 There is not much more darling a sight than that of a mother duck followed by its brood of cute and fuzzy ducklings, waddling clumsily along. This is, of course, in sharp contrast to an adult goose with a fully functional food processing system that chooses to hang out at a place where my children like to run around bare foot. I’ve done a little research on the goose thing. It’s illegal to even think about causing harm to a Canada Goose. Ok, that’s a slight exaggeration and one that if true would have me behind bars for a very long time. Back to the darling ducks. Sometimes they waddle their cuteness into harm’s way. Its our fault, of course. If we would have left their ponds alone the ducks could safely waddle their way through their uncluttered little duck lives. But no, our sprawling communities have taken up more and more duck habitat. During springtime, those cute little creatures can find themselves in very serious danger, particularly when their waddling path takes them across a street or a highway. It is a time of year when we pay extra close attention to the road, to avoid the tragedy of running them over. Imagine the horror! My wife covers her eyes and cringes when a gopher or squirrel darts out in front of our car and it just about makes her sick if we feel and hear that tell-tale “thump thump”. She looks at me like I’m the devil when I don’t slam on the brakes or swerve. Imagine her reaction if any of those cute, fuzzy little ducklings ended up under one of our tires! They’re not the most spatially aware creatures. They won’t immediately disperse if you get close with your vehicle. You have to sit there and wait for them to finish their casual waddling across the road before continuing on. At least with your vehicle sitting there a less concerned motorist won’t come along and mow them down. These would have been Emma’s thoughts on a nice, relaxed Sunday in the Summer, 2010. Emma, a young driver, stopped her vehicle on Highway 30, south of Montreal, to tend to a family of ducks. Emma is in trial this week, hoping that a jury will not convict her of two counts of criminal negligence causing death and dangerous driving causing the deaths of a father, Roy, and his 16 year old daughter, Jessie. Jessie was on the back of Roy’s motorcycle. They were following a car in the fast lane, when the car they were following swerved at the last minute to avoid smashing into the back of Emma’s stopped car. Roy and Jessie didn’t have a chance. Not only “negligent”, but in Emma’s case the jury might find that putting the safety of an animal above the safety of other human beings sharing the roadway is “criminally negligent”.